Get your Race The Sun jokes ready now: Ford will show a solar-powered version of their C-Max plug-in at the Consumer Electronics Show in Las Vegas next week. It's a C-Max you don't have to plug in at all and it should get around 100 MPGe. The C-Max Solar Energi Concept, co-developed with Ford's solar energy partner SunPower and tested at the Georgia Institute of Technology, has solar panels bolted on its roof and needs a day in the sun for full power. Full power, in this case is a four-hour charge. The solar panels have cells that absorb light through Fresnel lenses that act the same way a magnifying glass does; if you were that kid who burned ants when you were little, it's the same idea, except without the torturous, smoking insect death. The lenses track the sun's movement from east to west each day. While the solar C-Max isn't reliant on the grid, it does have a port for drivers to load electric power the old fashioned way. It has a total range of 620 solar miles and 21 electric-only miles. Ford says the solar C-Max gets just as much mileage as its current-market plug-in hybrid C-Max, which is 108 MPGe city and 92 MPGe highway, making a combined 100 MPGe. We know to take any C-Max mileage numbers with a grain of salt since there were issues with the hybrid model, but that's pretty impressive nonetheless. 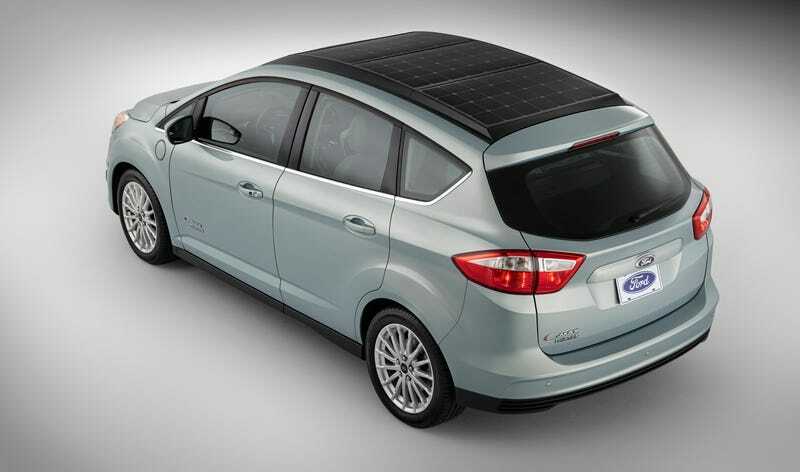 Ford will weigh response to the solar C-Max (can we call it the C-Max Del Sol? C-Max Solara?) at CES and begin real-world testing soon to determine if it'll go into production. We're predicting steady sales everywhere except Seattle.